A truly beautiful king size sculptural headboard, designed by Kipp Stewart for Drexel's ‘Declaration’ line. This line uses carefully chosen pieces of solid walnut with a softly lustrous rubbed oil finish. The construction is superior, and the details are really wonderful. Notice the squared, tapered posts and the elegantly curved backrest with beveled, flared spindles. Gorgeous! This piece is in amazing vintage condition with barely any signs of age. Wow! 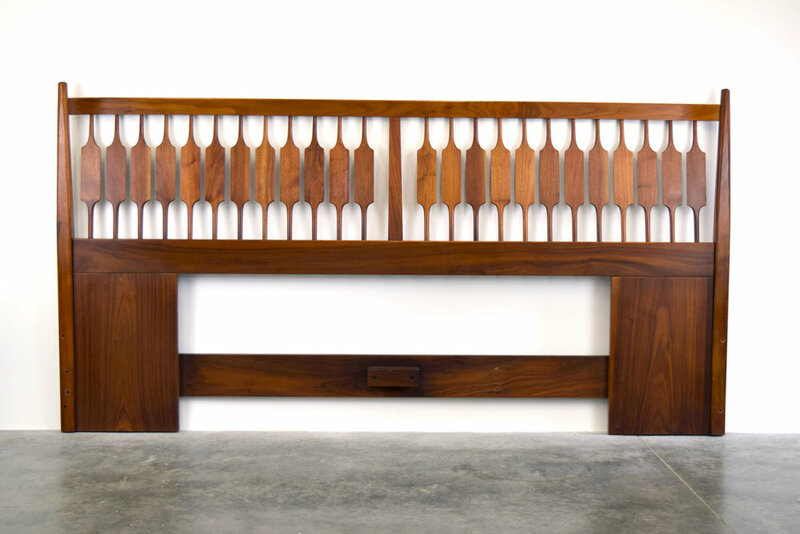 This full-sized headboard by American master Paul McCobb for the Irwin Collection is just stunning. Very heavy, with gorgeously figured walnut panels and solid brass edging details. This is an heirloom piece that will surely increase in value. This is one of our very favorite Danish bed designs! Elegant bed frames by master cabinetmaker Povl Dinesen, circa 1960. Finely detailed with solid teak turned and tapered posts, tapered legs, arched footboard and glowing, iridescent veneers. These beds could also be pushed together and used as a king size bed, as was common in the 1950s. This set has been thoroughly cleaned and conditioned and is in good vintage condition with wear commensurate with age and use. 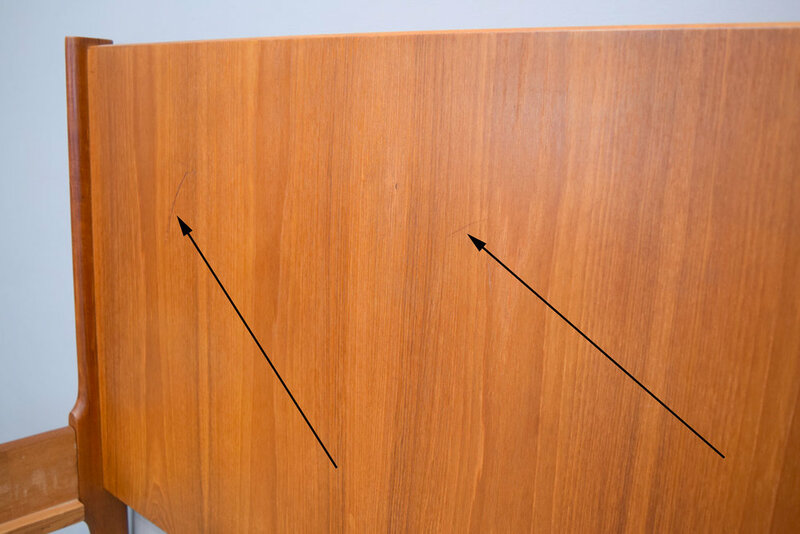 One footboard has scratches as shown. Legs have numerous dings and bruises. There are a few chips on the side rails. If you choose to use these beds without box springs, we recommend wooden bed slats such as these from Ikea or these from Amazon. 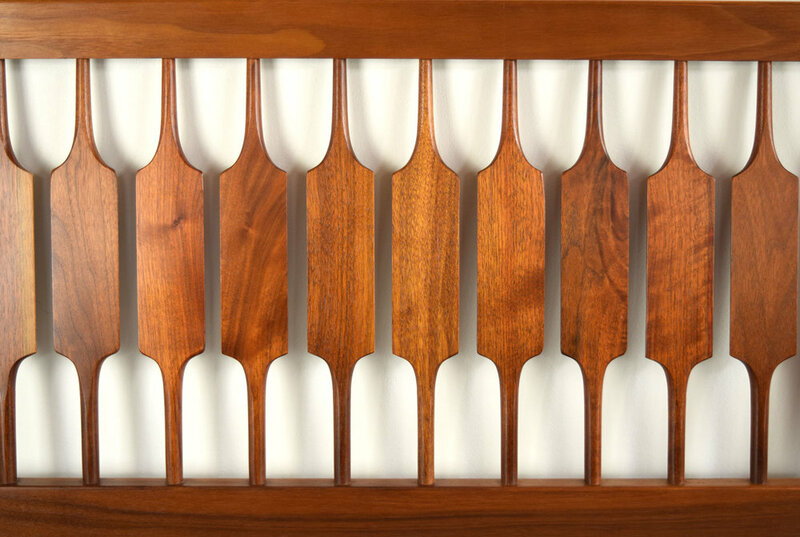 A beautiful, glowing teak headboard made in Denmark by Vinde Mobelfabrik. Fabulous matched grain veneers with solid teak edging. In excellent vintage condition with age appropriate wear and a small non-structural crack below the mattress line as shown. This bed has slots to accommodate either twin (slots are 37” apart for a twin frame) or daybed (32 3/8”) . Gorgeous teak single bed by Dyrlund, circa 1960s. This sweet bed is in excellent vintage condition with age-appropriate wear as shown. Three box spring supports are included, or you can use inexpensive slats if you prefer just a mattress. Please note this fits a European twin/single sized mattress measuring 39" W x 75" D. (A twin XL mattress might fit, or any mattress company can make the exact size.) Great for a kid's room or in a guest bed room!